In part one I talked about the different methods of cooking on a barbecue, now I'm going to give you an overview of the components and their importance for a successful barbecue. The two main types of charcoal are briquette or hardwood lump, some purists prefer the more nature hardwood lump. Myself I like a mix because the hardwood lump lights quicker and burns faster, whereas the briquette is harder to light but burns for longer. If your barbecue runs for a long time you may need to top up the charcoal and for this I would use the hardwood lump if possible. Remember the new coals will need to temper to get well alight before you resume cooking, or you will get a lot of soot on your food. Find a flat area of ground, think about wind direction because you don't want it either blowing smoke in the direction of your guests or your neighbor's clean washing. Don't place the barbecue close to the ornemental pond or you will attract too many bugs. I find that Citronella offers excellent protection against mosquitoes whether in the form of candles or torches filled with oil. Use these in smaller areas, such as on the patio while dining or entertaining. Is always a good idea to have a work table close by. A 6 foot table (1.8288 metres) is ideal and make sure you set it up on a stable (flat) part of the garden,so it does not tip up. I usually set up the table so as to create a L shape with grill, but not too close. If you are planing a large barbecue you might consider a second table to act as the buffet table, just make sure it is not too close to the barbecue or your work table. It is also useful to have a cutting board and a couple knives handy but remember, never cut cooked meat on a board you have been using for raw meats. 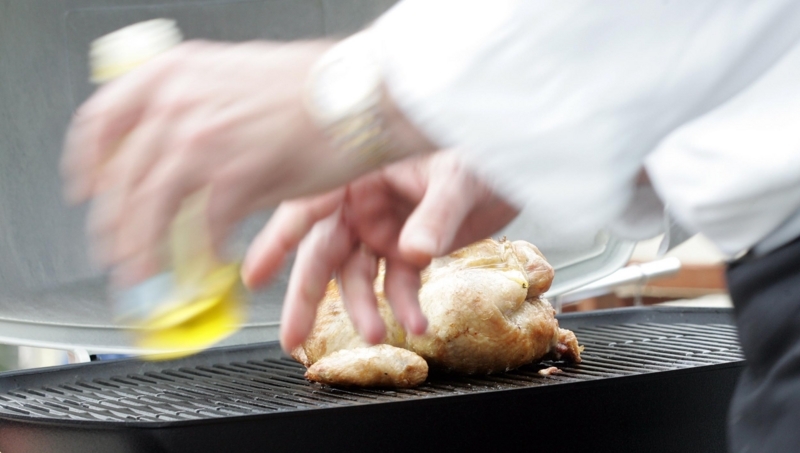 Good barbecuing is about controlling the heat, preparation and having things to hand. 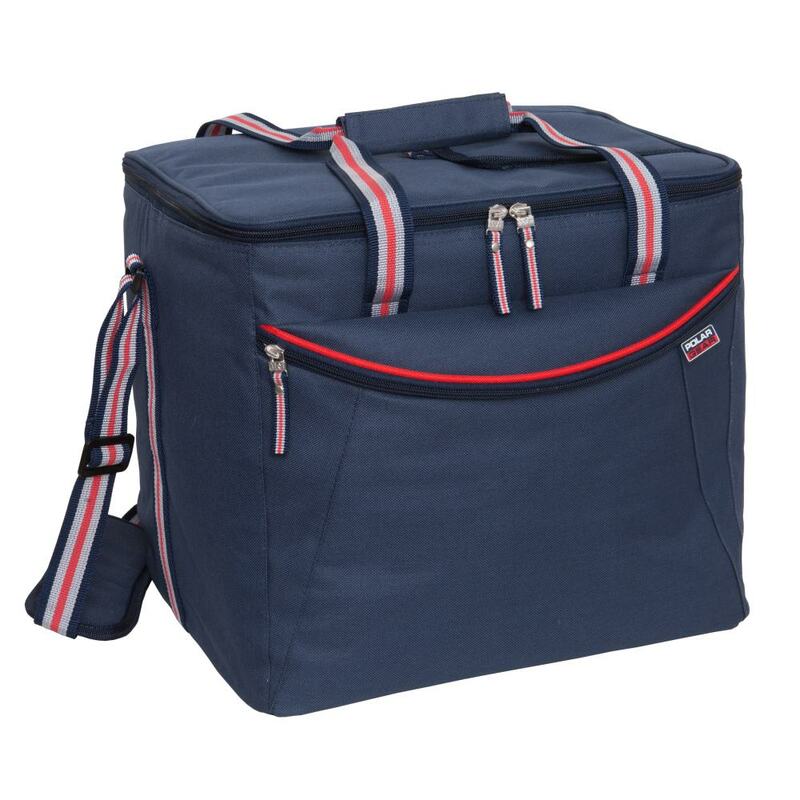 Invest in a large cooler bag (about 26-30 litre size) and cooler blocks to stop all the running back and forth to the fridge. Put your prepared food stuffs into separate plastic containers which can keep cool in your cooker bag. Make sure your cooler blocks are put in your freezer 24 hours before hand. In warm weather don't take any raw meats or seafood outside until you are ready to cook. I like to prep everything in the kitchen then put the foods into plastic containers. The plastic containers then get put into a large cooler bag with 3-4 frozen cool blocks to keep the food nice and cold. This way you don't need to keep running backwards and forwards to the kitchen whilst your food on the grill is burning. If you're having a buffet table with things like coleslaw, potato salad etc keep cling wrapped in the fridge until you are about to serve. Have heat proof containers to transfer cooked food into...don't put the cooked food onto plates or bowls that had raw foods in them. If you wish to use a barbecue sauce don't put it on too soon. Most barbecue sauce have brown sugar, honey, or molasses all of which burn very easily. Just brush BBQ sauce on during the final minutes of cooking. The day before a large barbecue I always make a casserole type dish such as Chili or Curry you might say "It's one I made earlier". I do this for 2 reasons….. 1.) If the weather turns bad and I have to bring the guests in they can still eat. 2.) Often when barbecuing you run out of food until the next batch is cooked, so by having a ready-made dish you can offer to people who don't want to wait. If you wish you can reserve part of your grill top to warm sauces etc. If making your own burgers make them several hours before hand, this helps to keep there shape and prevent them from falling apart on the grill. Make sure you have a place for keeping your grilled food hot/warm. Cook the longer cook items such as chicken before you cook the burgers. If you need to cook a large number of sausage for your barbecue consider par cooking them in boiling water (add a chicken bouillon cube if you like), then finish them on the BBQ grill. The chips must be well soaked in cold water several hours before, so when they are sprinkled on top of the hot coals they smoke rather than catch fire immediately. Big wood chips like the ones in the photograph are meant for barbecue grills and smaller chips (that look more like shavings are meant for smokers ). Apple Very mild with a subtle fruity flavor, slightly sweet. Good with poultry (turns skin dark brown) and pork. Hickory Most commonly used wood for smoking--the King of smoking woods. Sweet to strong, heavy bacon flavor. Good with pork, ham and beef. Lilac Very light, subtle with a hint of floral. Good with seafood and lamb. Mesquite Strong earthy flavor. Good with beef, fish, chicken, and game,one of the hottest burning. Mulberry The smell is sweet and reminds one of apple. Oak Heavy smoke flavor--the Queen of smoking wood. 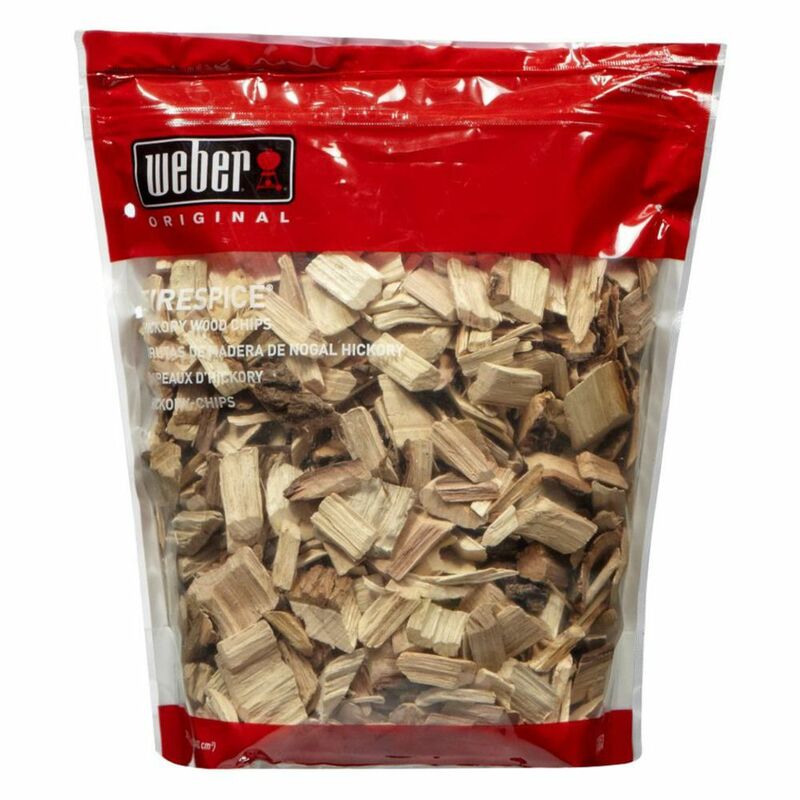 RED OAK is good on ribs, WHITE OAK makes the best coals for longer burning. All oak varieties reported as suitable for smoking. Good with red meat, pork, fish and heavy game. The secret to using wood chips on your barbecue is to soak the chips the night before in cold water so they smoke rather than burn on the grill. Most of the clean up of the grill should be left until the grill is cool. 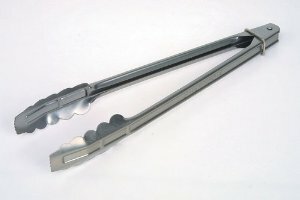 But you should definitely brush the grill bars down well with a sturdy wire brush. Barbecues can be great social gatherings especially if yours gets a reputation for good food. With that in mind don't allow young children close to the BBQ when it is hot. If there is any unruly kids looking likely to cause an accident designate another adult as the safety officer to keep the kids away from the grill, after all you can't be expected to cook and watch the children. Its a matter of personal taste which you use but make sure you have more that one and that they stay dry. A wet oven cloth gets very hot because the water turns back into steam. Look out for final part 3, coming soon.